Today the HAUS team had their second of four days of classes with hairdressers in the Umpiem Mai refugee camp. 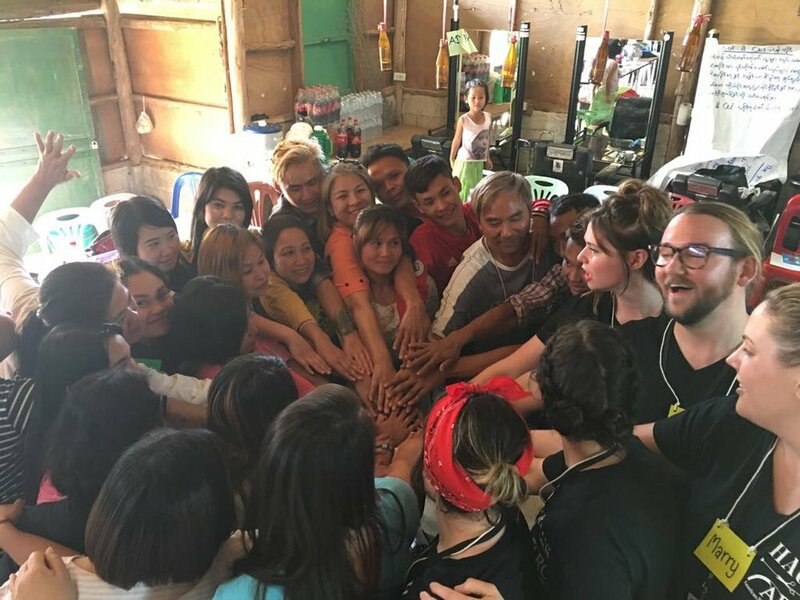 Below, HAUS Salon co-founder Charlie Brackney Love leads the second day of class with hairstylists in the Umpiem Mai refugee camp in Thailand, along with Mary, Sarah and Lindsey from HAUS Salon North Loop, and Natalie from HAUS Salon in South Minneapolis. We believe the photos tell the story. Charlie, Natalie and "Marry" lead a group cheer to celebrate the day! The HAUS team brought many many hair tools such as hair dryers (as Natalie highlights on the left), brushes, combs, shears, clips, hot tools and more. These tools were donated to the hairdressers in Umpiem Mai camp to help them succeed in their salon business. HAUS Salon General Manager Mary taught the students the importance of using a business card to help clients find their salons and how to use them to ask for referrals. Using the HAUS Salon business card as an example, students sketched out how their business cards might look. This contact information is important for clients to be able to schedule services at their salons. Even when in Thailand, we still LOVE a good mirror selfie! This is the site of our class each day, with a little furry friend perched out front to greet us. Cherry Jun got a beautiful long layered haircut from Charlie and a blowout style by Lindsey. Nearly every moment of a haircut or style demonstrated is surrounded by smart phones taking photos and video of every detail to memorize in the days after class is complete.